Parchem offers a full range of Trowel Blades and Pan Floats to suit all popular power trowel models . Combination blades are designed for operators who wish to use one blade for both floating and finishing applications. During the initial stages of power trowelling the blade is set flat and is used for floating, as the slab firms up the blade pitch is increased to produce a smooth finish. Finishing blades are designed to produce a smooth and polished finish to the concrete surface. After the slab has firmed up, blade pitch is increased to a greater angle resulting in a smooth and polished finish. Float blades are designed to clip onto finishing blades. Float blades are used in the flat position, breaking down high spots whilst working aggregate down and bringing mortar to the surface. Pan floats clip onto both finishing or combination blades. 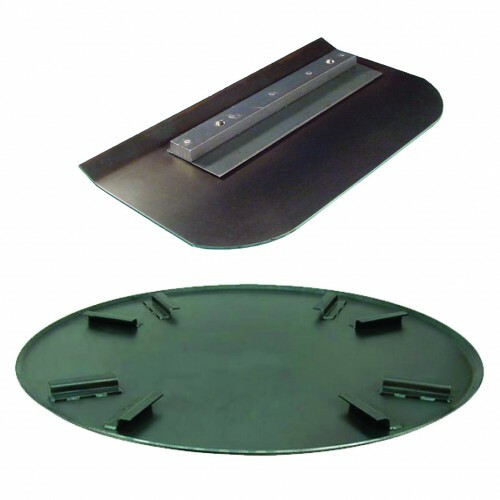 Pan floats with their large surface area achieve flatter floors than traditional float blades as are they are more efficient in removing imperfections, bumps and voids.